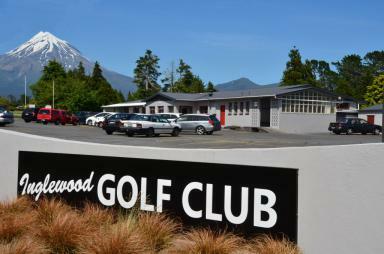 Inglewood Golf club is 5 minutes North of Inglewood and 15 minutes South of New Plymouth. It is an easy walking course with tree-lined fairways and beautiful mountain views. The course is situated on Upper Lepper Road, off Junction Road near Inglewood. Click here to get Google Maps directions. Par 68, 4793m (men), 4354m (women). Inglewood is a very welcoming club with a number of playing options. Caterer and clubhouse available for outside functions. Green Fee & Reciprocal rights players please note - Course not available Tuesdays before 11:30am and Saturdays before 12:00pm without prior arrangement with Club Captain. EFTPOS for Green Fees Available at all times. Join our club online here today! Twilight on now Wednesdays until 14th March. Non-Golfers Welcome (prizes for non-golfers by lucky draw). Entry $5, Twos $1. Tee off from 4pm to 6pm. You can download the Inglewood Golf Club 2019 Programme Booklet here.